What could be better than taking these three to the grocery store with me????? I actually don't mind taking my kids grocery shopping. They usually do great but I will admit that it's a little refreshing to go alone. And often in the summer, I will wait until they are all in bed and go late at night when the stores are empty and it's quiet and I might even take a Sonic drink to sip while I leisurely get my groceries. But in the winter when it's cold and dark, I hate getting back out so I take the kids or go while they are in school. So I'm VERY thankful that Walmart started their grocery pickup service!!!! Have you tried it? I started using it when it was a test run in my town and I was very pregnant with Will Holden and could barely walk the store without going into labor. It was a life saver honestly. And then when he was a newborn - I loved not having to get a baby out. And even now, it's just so convenient and easy! Like yesterday - I booked a time online at my local store for right after school. And I spent maybe 10 minutes getting all the things I needed. It's all sorted by category or I just search for what I want and options pop right up. And there are tons of organic options if that is what you like. They called me to tell me it was ready 30 minutes before my time slot. You can call them when you get there or there is an app that you can check in when you are leaving wherever you are and it will GPS for them how long it will take you to get there so they can know when you will arrive. (It's the Walmart grocery app). The kids and I pulled into our slot and they came right out and put the groceries in the back of my car for me. I never got out. And they offered to let me check the produce and eggs before they loaded it for me. The entire thing took maybe 5 minutes. I imagine for working moms or single moms - this would be the best gift ever!!! And there is NO extra charge for this. Have you used the pickup service and is it in stores by you? And since next week is Thanksgiving and you might be doing a lot of extra shopping - this might be a great time to try it out. Check it out to see if there is a store near you that offers pickup! Which by the way - if you aren't using the Walmart Savings Catcher app or the Ibotta App - you are missing out on EASY free money. This is something I make that I don't have an exact recipe for and I'm one of those people who doesn't fully measure out everything so I'll do my best ........these are SO yummy! 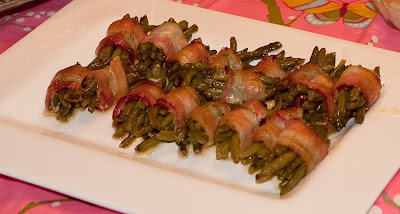 Wrap a handful of green beans in half a slice of bacon. That makes one bundle - keep going for as many bundles as you would like to have. Melt a stick of butter and stir in one cup of brown sugar (more or less depending on how sweet you would like it). Add a teaspoon of garlic salt. Pour over bundles. Bake at 350 for 30 minutes. Then put under the broiler for 4-5 minutes at the end. DELICIOUS! This is one of my favorite new sides. Just cut up Sweet potatoes into small bite sized pieces and spread out on a baking sheet and top with olive oil and kosher salt. Roast at 450 degrees for 30-40 minutes. SO GOOD!! !